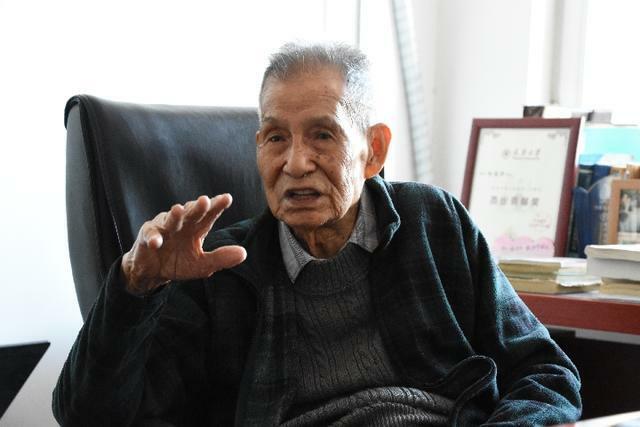 At the age of 100, Yang Enze, a professor in Tianjin University, still commutes to his laboratory every day and leads his students on research projects. As one of the founders of China's optical communication, Yang never left the forefront of scientific research. He keeps himself updated with the times by reading English articles on artificial intelligence. In the 1970s, Yang was the chief engineer of an optical fiber cable communication system built in Wuchang and Hankou in central China's Hubei Province, which was China's first optical communication project for practical use approved by the government. "The system was proposed by former Ministry of Posts and Telecommunications in 1978 when there was no previous research in this field domestically," Yang said. The optical communication system, covering a distance of 13.6 km, consisted of three optical fibers which were fused by splicers. It took three days for Yang and his fellow experts to control the loss of signals. Limited by the technical conditions, the third part of the optical fiber could only reach 5.5 km, still 1 km short of the target. "We worked for the whole summer in our lab. It was sweltering in Wuhan. I kept experimenting over and over again, hardly having a chance to wipe off my sweat," Yang said. The project went into operation at the end of 1982, and was followed by the establishment of optical communication systems in many other cities. China's optical communication industry saw rapid development. According to Yang, he used to dream about success when he was a student. He was admitted to Wuhan University in 1937, the year which saw Japanese troops attacked the Lugou Bridge, also known as Marco Polo Bridge, on the outskirts of Beijing, on July 7. The incident marked the beginning of Japan's full-scale war against China during World War II and triggered China's full-scale resistance against the invasion. The university was relocated to Sichuan Province the next year before Wuhan fell to enemy forces. "There were a lot of bombs, but none of the students would miss any of the classes as long as there was no air-raid siren," he recalled. "I witnessed innocent people fleeing from their shattered homes...," Yang said. It was at that time he cemented his belief that a country needed advanced science and technology for revival. Yang built the first optical communication laboratory in Tianjin when he was invited to teach at Tianjin University in 1985. Since then, under his supervision, eight high-tech research projects at national level have been conducted, and more than 10 papers were published in China's top-notch academic journals. "Professor Yang often helps students to test, debug and optimize the research process. He emphasizes that academic research cannot be separated from practice," said Xie Tianyuan, a doctoral student from the School of Electrical Automation and Information Engineering. Yang leads a simple and frugal lifestyle and many of his clothes are worn out. Over the past years, Yang has donated more than 500,000 yuan to students who cannot afford education. According to Yang, exercise and persistence are the secrets to longevity and a long academic career. He started to learn computer skills when he was 60, and played tennis until he was 93 years old. "For me, I really enjoy doing scientific research. It is my lifelong career. To be able to work one more day, to do something for the people -- that is the biggest meaning of my life," Yang said.